Hospital hygiene is concerned with the prevention, detection and control of nosocomial (hospital-acquired) infections. 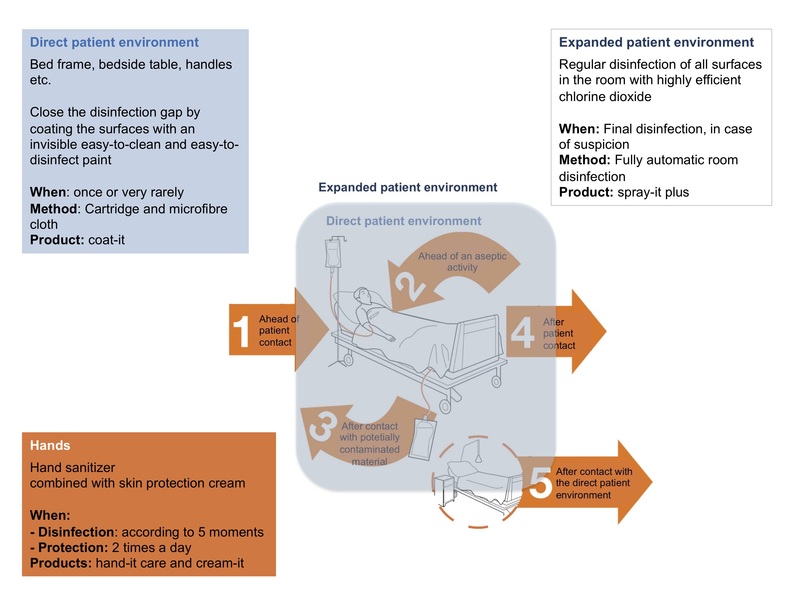 Our concept is based on the “5 moments of hand disinfection” Klick on the pictures below to get more detailed information. Surveys from various institutes have shown that the number of hospital-infected patients is still at a very high level. This means that in the field of hospital hygiene the goals have not yet been achieved. In 71% of cases, bacteria are involved (MRSA, P. aeruginosa, E. Coli, Acinetobacter) in 21% of cases, they are viruses (norovirus). In Switzerland alone, the number of documented cases has settled at 70,000, of which 2,000 are fatal. Studies from the 1980s already describe in detail how the contamination takes place, however currently implemented countermeasures are apparently still not fruitful. With a holistic approach, Novapura seeks to make the approach proclaimed by WHO safer and more robust by targeting the neuralgic points with specially designed products. We are aware that our products will not solve the problem once and for all. But we are convinced that we can do our part to bring about a significant improvement in the situation.